Today I'm cleaning...in my kitchen...normally not a job I hate, but today...! It seems my refrigerator is not cooling like it should so I had to take everything off of it so the repair tech could move it out to take a look at it. This is what I had to take down. Whew! 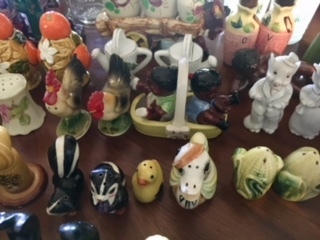 I've been collecting salt and pepper shakers for years. 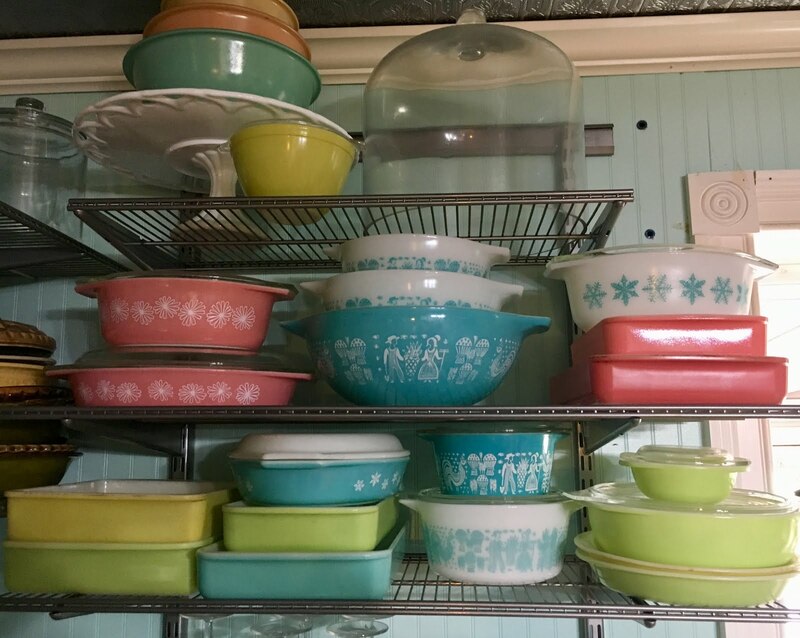 Not only did I have all of these to wash, but I used cake plates and cookbooks to arrange all of these so they could all be seen. All of those had to be washed and dried also. So all morning has been devoted to washing these and shaking all the water out...now that they are clean, I'm kind of thinking I might put them somewhere else, just not sure where yet. Our first auction starts Thursday, May 31, 2018 and ends Sunday, June 10, 2018. This one is our first so it's not real big but there are some great items. PLUS..ALL OF OUR AUCTIONS START AT $1.00! 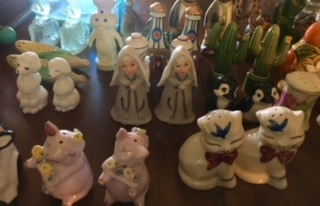 We have a few items that have reserve prices but most do not! Please browse through all of them and let us know what you think. We can't begin to tell y'all how excited we are by all this, we hope you will share in our enthusiasm. If you like our app, we'd love it if you could leave a review in the app store. This is gonna be a great year and you all are such a HUGE part of our success! We deeply appreciate all of you for your friendship and kindness! 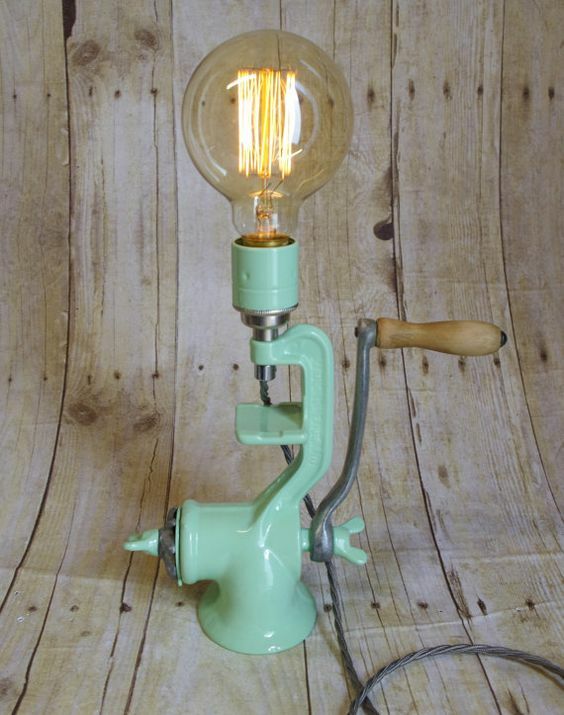 We love unique lamps and light fixtures and frequently make some that are available for purchase at our sales. We have been so busy lately that we haven't had a lot of time to craft some but we plan to make more soon. Here are some cool ideas if you start feeling like you want to get "lit up"! 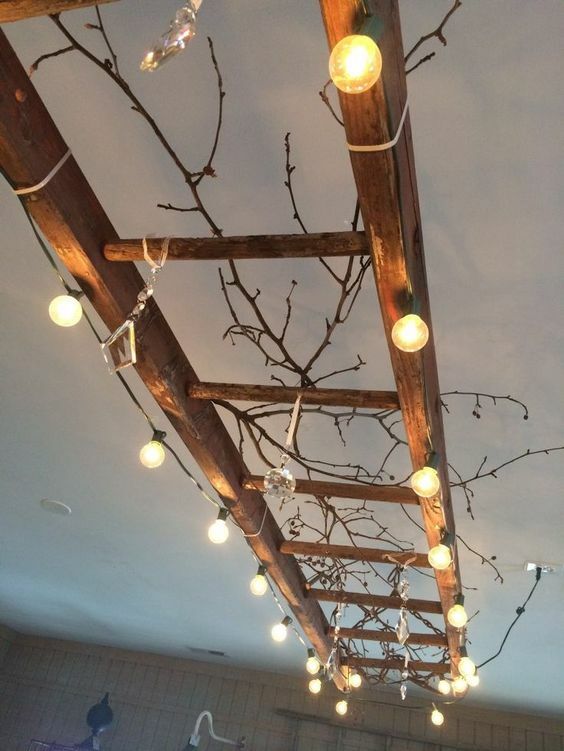 A simple wooden ladder, some branches and two strands of lights...boom! Awesome for a patio or sunporch. We have these meat grinders at almost every sale! Love the shiny enamel paint! These vintage teacups are very plentiful and the socket ends like this are available at the big box hardware stores. 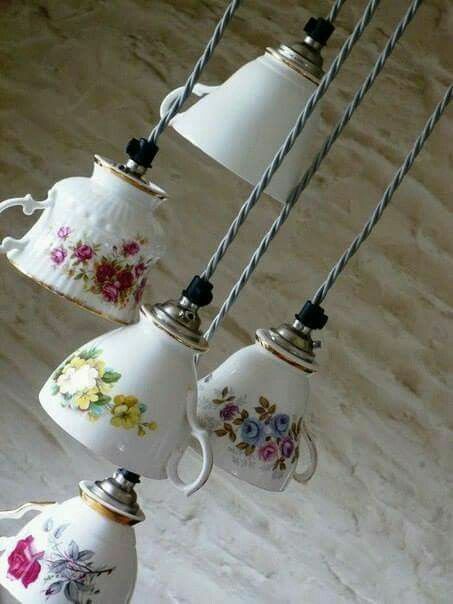 Use a porcelain bit to drill the holes and you can have as many lights as you want on your fixture. 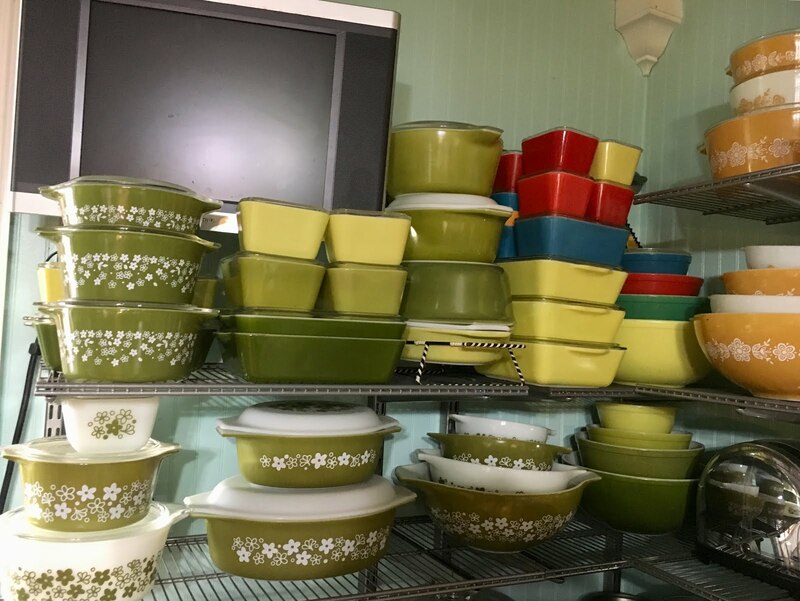 Recently, I went on a treasure hunt (exploring new flea markets and stores) and I found so much vintage Pyrex I didn't know if I had room to bring it all home! These places were just gold mines for the stuff that day! Sometimes you get lucky like that! Anyway, I bought as much as I could and drove home very carefully, lol. I found pieces in turquoise, pink, lots of green, lots of gold, some blue and yellow and orange! I found a couple of sets of the peek-a-boo bowls with clear bottoms and left a few of those behind too. They scratch really easily and some of them looked pretty raggedy. These pictures include most of my collection, but some were in the fridge. I use my Pyrex, I handwash it to keep the colors bright and clean and I have it on constant display in my small kitchen. Top cabinets made this small space look even more closed off and tiny, so it's all shelves. It really helps to open up the space. Some of the patterns I have are Amish Butterprint, Daisies, Golden Butterflies, Snowflakes, and lots of primary colors and pastel colors. Do you have any rare pieces? What patterns and colors do you collect? 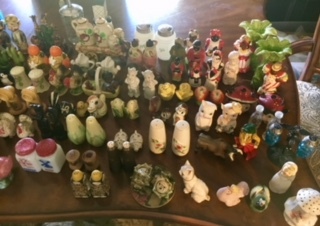 I'd love to see your collection! 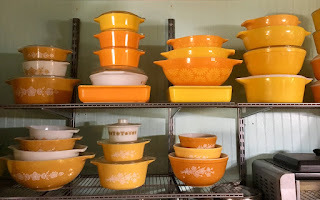 When I'm searching for info on Pyrex, two sources I use are Pyrexlove.com and the Corning Museum of Glass blog. Both are invaluable when looking up patterns and trying to find out if certain pieces were made in particular colors and patterns. Just in case you're wondering what some of these pieces can sell for, this piece recently sold on ebay...Happy hunting! Over the years we have run across some amazing vintage and antique toys...things like this spaceship by KO, made in Japan. The paint was in great shape and it still worked! This Texaco truck was huge and had great decals and paint. And these composition dolls that were well loved, Tinker Toys, marbles and paper dolls were all in one collection! 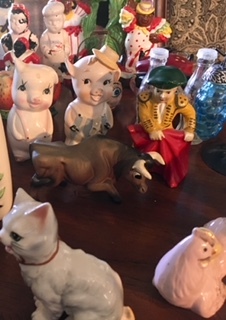 These are all great examples of vintage and antique toys that have appeal to collectors and to us baby boomers who remember simple toys like these. We love finding stuff like this, it's fun to look at, fun to display and to sell. On a side note, these kinds of toys are not in the same category as Beanie Babies, Madame Alexander Dolls, and some Barbies and Disney toys. Generally, the Beanie Babies, etc. have been produced to sell as a "collectible" first and a toy second. The manufacturers make hundreds of thousands of them, package then beautifully, and sell them at a premium price. Many come with certificates of authenticity and have very official looking pedigrees. They are absolutely a treasure to the person who buys them and loves them for what they are...but they are not a treasure that usually increases in value* with age or because of their "official" status. Whereas toys from back in the day that were well preserved usually do increase in value due to rarity and/or condition. I hope this clarifies the subject somewhat, the question usually comes up every couple of years. *As a general rule. However, there are always exceptions to every rule and some collectible dolls and Beanie Babies are very valuable. 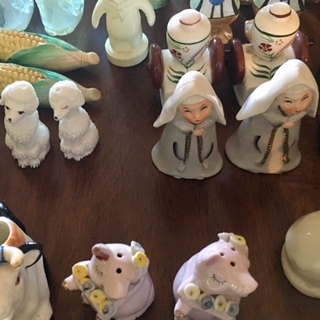 An experienced estate liquidator is more important than ever when things like this are part of the estate being sold. 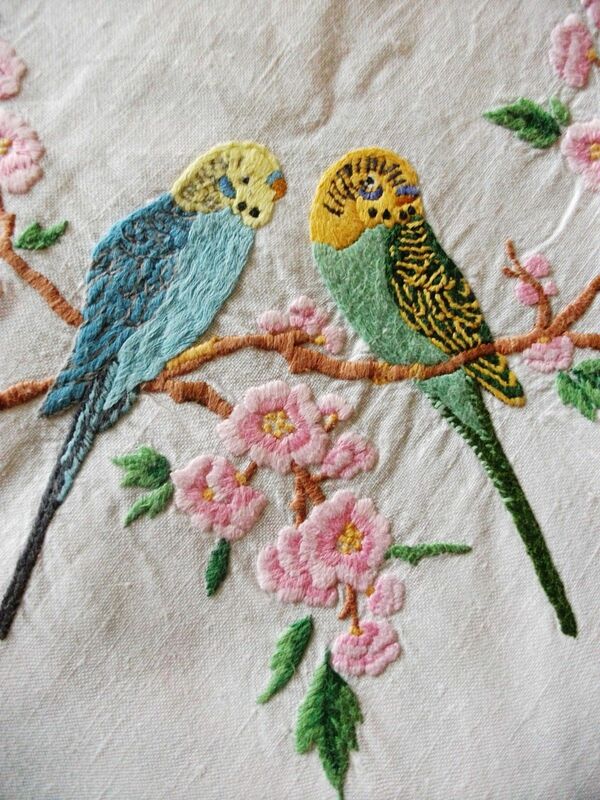 Vintage embroidered linens...the beautiful colors, the delicate workmanship, the patience and perseverance that someone lovingly bestowed on these treasures. If you are lucky enough to own some, take extra special care of them. So few stitchers these days that one day the supply will be gone...how very sad is that? want to have pieces our grandchildren can cherish. If you'd like to start with some embroidery, there's a link to a Pinterest board filled with simple outline patterns at the bottom of this post. Just print on transfer paper and iron on your choice of linens...dishcloths, aprons, quilts, scarves, you name it!